Dr. Kassicieh is a Board-Certified Neurologist and is the medical director of the Florida Headache and Movement Disorder Center. 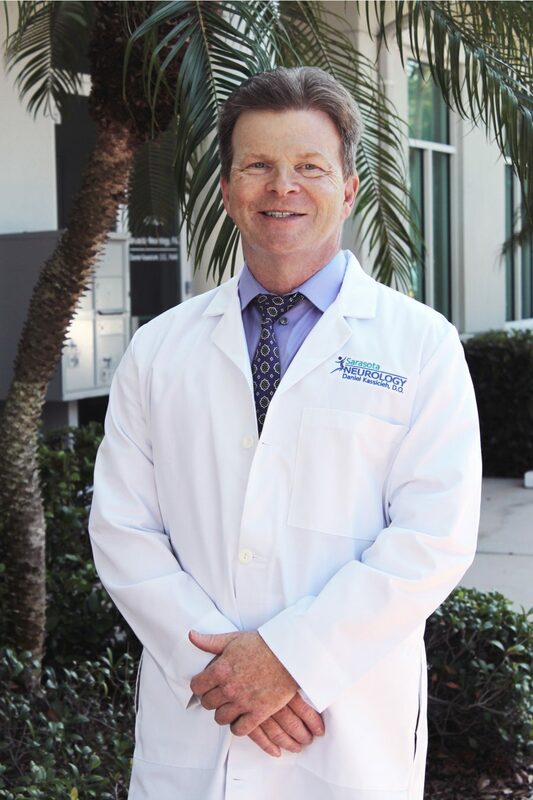 He has been practicing in Sarasota for over 20 years. Dr. Kassicieh is a Fellow of the American Academy of Neurology and the American College of Neuro-psychiatrists. Both of these honors were awarded to him on the basis of his extensive research experience, medical publications and continued support of patients and their families who are affected with neurological disorders. Dr. Kassicieh is a sought-after public speaker and is frequently a presenter both within the medical community and in the public forum. He has appeared regularly on local television and is considered an expert in a number of areas within his specialty. Dr. Kassicieh’s primary medical interests are in the treatment of Movement disorders including Parkinson’s disease, Essential tremor and dystonia treatment with Botox. He is also a migraine and headache specialist. He has lectured extensively and participated in several nationwide clinical studies in these areas, as well as stroke. In addition, he is a leading specialist in the usage of PRP for treatment of joint pain as well as PRP for hair loss. Daniel Kassicieh, D.O., FAAN, FACNDr. Dr. Kassicieh’s community involvements are numerous, and include serving as President of the Florida West Coast Parkinson Association (a National Parkinson Foundation Affiliate Chapter) for over 4 years. Why is Dr. Kassicieh a D.O. Instead of an M.D.? The “D.O.” designation stands for Doctor of Osteopathic Medicine and indicates a slightly different course of education than is involved in obtaining an “M.D.” D.O.s spend approximately 100 hours in the classroom more than M.D.s do. This additional training is focused on the Osteopathic (from osteo, “bone” and pathos, “disease”) aspects of medicine, specifically, the musculoskeletal system, which is made up of the nerves, muscles, and bones. This additional training gives Doctors of Osteopathic medicine a better understanding of how an injury or illness in one part of the body can affect another part of the body. Dr. Kassicieh chose to obtain this superior training in order to better diagnose and treat his patients, particularly since Neurology is inherently tied to the musculoskeletal system. In fact, the practice of non-surgical orthopedic medicine is intrinsically involved in Osteopathic clinical treatment, thus increasing the scope and holistic nature of Dr. Kassicieh’s neurology services. (Co-authored), Pain Medicine, The Official Journal of the American Academy of Pain Medicine, 2002; 3,4: 324-332. 1. Katz, Nathaniel P., et al, Lidoderm Patch Study Group: Lidocaine Patch 5% Reduces Pain Intensity and Inter-ference with Quality of Life in Patients with Postherpetic Neuralgia, Amer Acad Pain Med 2002; 3,4: 324-332. 2. Brashear A, Gordon MF, Elovic E, Kassicieh VD, Marciniak C, Do M, Lee C-H, Jenkins S, Turkel C (on behalf of the Botox Post-Stroke Spasticity Study Group including Kassicieh D, Ruffing KW and Halbert MR): Intramuscular injection of botulinum toxin for the treatment of rist and finger spasticity after a stroke. N Engl J Med 2002; 347: 395 – 400. 3. Tariot PN, Solomon PR, Morris JC, Pershaw P, Lilienfeld S, Ding C (on behalf of the GAL-USA-10 Study Group including Probst TG, Kaplan PR, Kassicieh D, Gallo BV, Ruffing KW, Grindal AB and Halbert MR): A 5-month randomized, placebo-controlled trial of galantamine in Alzheimer’s Disease. Neurology 2000; 54:2269-2276. 4. Diener HC, Cortens M, Ford G, Grotta J, Hacke W, Kaste M, Koudstaal PJ, Wessel T (on behalf of the LUB-INT-13 Study Investigators including Grindal AB, Kassicieh D, Probst TG and Halbert MR): Lubeluzole in Acute Ischemic Stroke Treatment: A Double-Blind, Study with an 8-hour Inclusion Window Comparing a 10 mg Daily Dose of Lubeluzole with Placebo. Stroke 2000; 31:2543-2551. 5. Morris DL, Rosamond W, Madden K, Schultz C, Hamilton S T (on behalf of the Genentech GSPS Study Investigators including Grindal AB, Kassicieh D, Probst TG and Halbert MR): Pre-hospital and Emergency Department Delays After Acute Ischemic Stroke. The Genentech Stroke Presentation Survey. Stroke 2000; 31:2585-2590. 6. Clark, WM, Wechsler, LR, Sabounjian, LA (on behalf of the Citicoline Stroke Study Group including Kassicieh, D.): A Phase III Randomized Efficacy Trial of 2000 mg Citicoline in Acute Ischemic Stroke Patients. Neurology 2001;57:1595-1602. 7. Clark WM, Wissman S, Albers GW, Jhamandas JH, Madden KP, Hamilton S et al (on behalf of the ATLANTIS Study Investigators including Grindal AB, Kassicieh D, Probst TG and Halbert MR): Recombinant Tissue-Type Plasminogen Activator (Alteplase ) for Ischemic Stroke 3 to 5 Hours After Symptom Onset. The ATLANTIS Study: A randomized Controlled Trial. JAMA 1999; 282: 2019-2026. 8. Aurora, SK, Gawel, MG, Brandes, JL et al for the BOTOX North American Episodic Migraine Study Group including Kassicieh, D: Botulinum toxin Type A Prophylactic Treatment of Episodic Migraine: A Randomized, Double-Blind, Placebo-Controlled Exploratory Study. Headache 2007; 47: 486-499. 11. Sacco RL, DeRosa, JT, Haley, CH et al (for the GAIN Americas Investigators including Kassicieh, D) Glycine Antagonist in Neuroprotection for Patients With Acute Stroke GAIN Americas: A Randomized Controlled Trial. JAMA. 2001;285:1719-1728. 12. Silberstein, SD, Gobel, H, Jensen, H et al (on behalf of the Botox CTTH Study Group Investigators including Kassicieh D): Botulinum Toxin Type A in the Prophylactic Treatment of Chronic Tension Type Headache: A Multicenter, Double-Blind, Randomized, Placebo-Controlled, Parallel-Group Study. Cephalgia 2006; 26:790-900. 13. Sheena K. Aurora, MD,* Marek Gawel, MB, BCh, FRCPC,† Jan Lewis Brandes, MD,‡ Suriani Pokta, PhD,§ Amanda M. VanDenburgh, PhD,§ for the BOTOX North American Episodic Migraine Study Group (including Kassicieh D); Botulinum Toxin Type A Prophylactic Treatment of Episodic Migraine: A Randomized, Double-Blind, Placebo-Controlled Exploratory Study. Headache 2007; 47: 486-499. 14. LeWitt, P, Lyons, K, Pahwa, R et. al. (on behalf of the SP 650 Study Group including Kassicieh, D): Advanced Parkinson Disease Treated with Rotigotine Transdermal System – PREFER Study. Neurology 2007; 68:1262-1267.